There are a number of new and old premium WP theme clubs these days. Likewise, many people or blogger who own several websites also prefer good theme club that will result in getting quality themes for all of their sites. However, things can get a little confusing when people try to decide which WP theme club to join. The customer will always look towards quality, unique and responsive WordPress themes. On the other hand, many new WordPress theme providers such as Thrivethemes, StudioPress, Tesla Themes, Mythemeshop, Themeisle and more are offering tons of features for their premium customers. Among these two new up comers are rocking and they are probably the TeslaThemes and Themeisle. Before getting started, let me tell about the factors which you need to consider from any WordPress theme clubs. And in this post, I’m going to compare TeslaThemes Vs Themeisle on these factors major factors from design to price along with their notable features. Without any introductions let’s check out the comparison section! As you know, TeslaThemes are good on providing unique and quality WordPress themes than another theme clubs. The number of premium themes more when compared with Themeisle. As of now, TeslaThemes offers 50+ premium themes but Themeisle offers only 18+. Also TeslaThemes instruction documentation on installing the theme and other functionalities in more detailed and clear guide files. Both this club offers clear documentation file along with online documentation and FAQ. Under the themes section, people always expect on quality, Responsive, Customization, Updates and HTML themes. Responsiveness: Both TeslaThemes and Themeisle clubs offer quality responsive themes without any extra charges for making themes full responsive. And mainly they offer only unique and best-quality themes for cheaper when compared to other theme clubs. So, in term of responsiveness it’s very hard to say which is best, almost both are competiting here. Customization: Every customer will look to re-design the theme with some tweaks on their own or some free customization. And the free customization option is only available on TeslaThemes but not on Themeisle. The Themeisle won’t allow any buyers to customize or to re-write the code but TeslaThemes will allow all the buyers for One Hour free customizations where during the period they can tweak the themes as they wish! Theme Updates: Themeisle doesn’t update their club with new themes regularly. However, TeslaThemes constantly updates with new themes and every week new themes is guaranteed. HTML Themes: There are no HTML themes available for Themeisle buyers but TeslaThemes does. TeslaThemes will provide the HTML versions of the WP theme you are buying with full access and also you can convert HTML themes to Drupal, Joomla or to some other platforms. Before joining any theme clubs, you need to make sure about the number of supported domains terms. Most of the theme clubs won’t allow you to install one them on unlimited domains. They got some restrictions on domains. As I was saying, the Themeisle got the restrictions and the basic plans allow the buyer to install one theme only on 3 domains which will cost you around $99. If you want to for install the same theme on other domains then you need to buy another package by paying more. In Teslathemes, there are no issues! You can install the same theme on as many sites you want! It only cost you the normal theme price, so you don’t need to pay any extra cash. One of the important thing to be noticed before joining a theme club is the Pricing Packages. The price may vary depending on a number of themes and the customer support. You can get the access to all Themeisle themes at $99 but you will only get basic customer support. In TeslaThemes, you will gain more features by paying less. Yeah, you heard it right! By paying $59 per year, you will get access to all themes (56 Themes now) and every year you can get 18+ new themes. The best part, you will get quality technical and priority support under this low package. 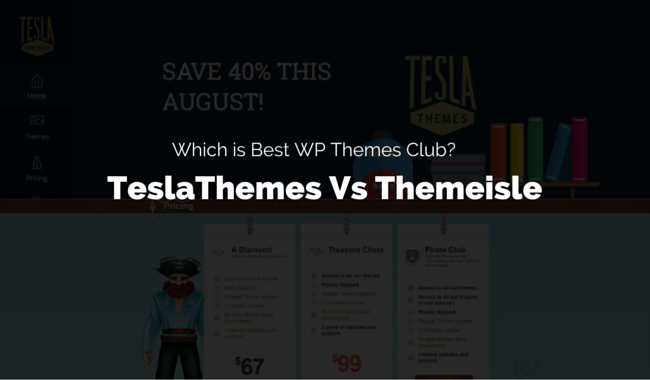 Both the TeslaThemes and Themeisle themes offer lifetime packages. Themeisle lifetime package will cost you $249 per year and you will unlimited domain license just on themes and priority support care. Also, you will get lifetime access to their 20+ themes every year! When compared to TeslaThemes, the lifetime package of Themeisle cost you more! By paying $199 as one-time payment, you will get lifetime package on TeslaThemes. And you will get access to unlimited domain license, and access to all themes with quality technical support. Here the best part, you will get all HTML & PSD file for all TeslaThemes. Is there any refund or money back guarantee? Yeah, Themeisle will refund your money within 30 days under certain circumstances along with return cookie of 365 days. On another hand, TeslaThemes will refund your money if you found any issues within 14 days and it got 90 days policy for returning cookies. These every blogger working on affiliate and that helps the company to sell their products easily by sharing certain commissions with their affiliate marketers. Here both the theme club offers this feature but the commission rates per sale differs. Themeisle offers 55% commissions of their all affiliate where Teslathemes offers only 50% commissions. But when compared with 2nd Tier Lifetime Commission, TeslaThemes offers 15% per sale, where Themeisle doesn’t! And you need to reach $100 to get paid from Themeisle which may be dragging a lot. But in TeslaThemes, there are no such limits. You will be paid regularly even if you have earned $1 which is quite impressive! Another great feature, if you have any coupon site then you can use TeslaThemes as your branding name and you can add coupons codes there using your affiliate links. But this feature is not available in Themeisle as they are new to affiliate marketing! TeslaThemes doesn’t sell any plugins, rather if you are looking for some good premium plugins then you can go for Themeisle Premium Plugins as they offer quality plugins. Both TeslaThemes and Themeisle look good under all circumstances! But a majority of the features offered by TeslaThemes which should be considered. What’s you view about the TeslaThemes? Which one do you consider to be a winner? Share them below!